What is another word for overwhelming? overriding, damning, staggering, crippling, compelling, impressive, devastating, unstoppable, conclusive, convincing, astonishing, appalling, extraordinary, incredible, gigantic, significant, enthusiastic, insuperable, big, major, absolute, mind-boggling, prevailing, wide-ranging, shocking, dominant, incontrovertible, extensive, overarching, astounding, intense, wonderful, amazing, terrific, breathtaking, colossal, terrible, dramatic, whopping, awe-inspiring, unanimous, awesome, immeasurable, extreme, indisputable, remarkable, pressing, phenomenal, high, highest, disproportionate, far-reaching, utmost, sheer, serious, undeniable, large-scale, mass, burdensome, monumental, mighty, heavy, giant, unbelievable, overwhelmed, ample, excessive, unbearable, sizeable, dire, yawning, crucial, surprising, prominent, striking, unquestionable, fierce, undoubted, urgent, powerful, mammoth, startling, violent, onerous, generalized, warm, profound, wholehearted, innumerable, magnificent, comfortable, outstanding, grave, distressing, gaping, cogent, persuasive, paramount, pervasive, comprehensive, challenging, clear, GRANDE, exceptional, intractable, imperative, pre-eminent, utter, important, broad-based, forceful, alarming, corroborative, hard-hitting, sizable, general. 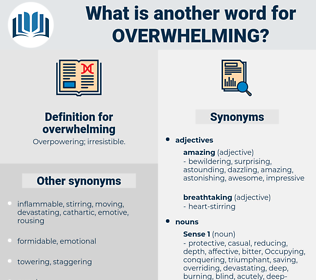 overpowering, Overloading, overburdening, grinding, Burdening, overriding, damning. vast, immense, enormous, resounding, tremendous, daunting, great, massive, irresistible, insurmountable, large, formidable, considerable, stunning, strong, predominant, irrefutable, wide, preponderant, widespread, broad, substantial, grand, severe, decisive, vigorous, sweeping. The thought of all that she had risked and suffered for my sake crowded back into my mind with overwhelming force. Dynes's evidence is clear, and the proof of motive is overwhelming.